Thousands of people crammed into Belfast city centre today to enjoy the annual St Patrick’s Day parade and concert. Taking a traditional look at the story of Ireland’s patron saint, a giant puppet of St Patrick set off chasing model snakes along the parade route as people of all ages lined the streets. 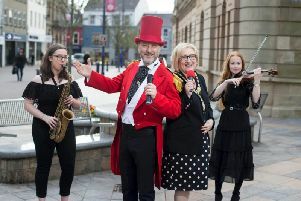 During the event the city came alive with colour and music as musicians and pipe bands, eye-catching floats, carnival dancers and performers made their way to Custom House Square. At Custom House Square, Strictly Come Dancing finalist and member of smash hit boy band ‘Blue’, Simon Webbe, entertained the masses as this year’s headline act.